His reputation spread throughout show business and soon became obvious that he would have to make a decision about his future career. In 1974, Tom hung up his cap and gown for good to become a full time comedian. 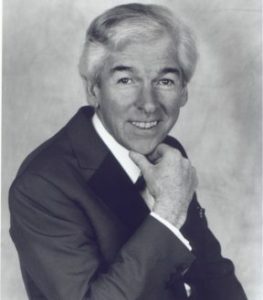 Tom O’Connor has become a household name through the realms of television hosting his own shows. Not only that, Tom has carved a fine reputation for himself as a most accomplished quiz and game show host with no less than seven successful series to his credit. Tom’s success, however, has not only been confined to television. In cabaret he starred at every major nightspot in the country, and headlined his own successful summer season shows in the country’s top resorts. His work has taken him to most English speaking countries including America where he featured at the prestigious Carnegie Hall in Manhattan. Tom is in constant demand as an after dinner speaker and awards host for corporate functions both in this country and abroad and, as a result of his two best selling humorous golf books ‘From the Wood to the Tees’ and ‘One Flew Over the Club House’ he receives countless invitations to appear as the guest celebrity speaker at golf society functions both here and as far a field as Spain, Portugal and the Middle East.